Featuring two short films produced by Rocket Soul Shorts, a local company. Including a Q&A with directors after the films! Climb-It Change brings the worlds of conservation science and outdoor recreation together. This film tells the story of researchers Trevor Bloom and Matt Kneipp as they traversed and rock climbed the entire Rocky Mountain chain investigating the impact of climate change and increased wildfires on high elevation environments. When Kathy's father shows up a little late for their monthly lunch date driving the 1967 Firebird she helped him restore as a child she soon realizes that it is just the first of many surprises he has planned for the day. Featuring two short films produced by Rocket Soul Shorts, a local company. Including a Q&A with directors after the films! Climb-It Change directed by A.J. Winslow Climb-It Change brings the worlds of conservation science and outdoor recreation together. 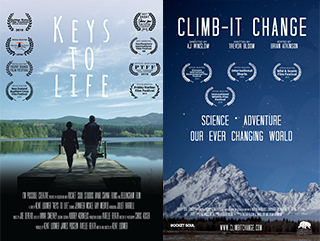 This film tells the story of researchers Trevor Bloom and Matt Kneipp as they traversed and rock climbed the entire Rocky Mountain chain investigating the impact of climate change and increased wildfires on high elevation environments. Keys to Life directed by Kent Loomer When Kathy's father shows up a little late for their monthly lunch date driving the 1967 Firebird she helped him restore as a child she soon realizes that it is just the first of many surprises he has planned for the day.